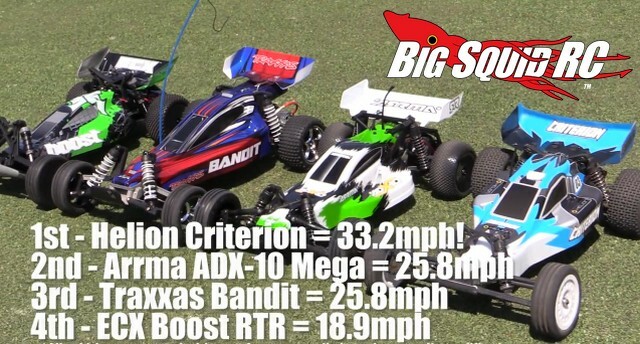 Video – Helion Criterion Top Speed vs Competition « Big Squid RC – RC Car and Truck News, Reviews, Videos, and More! We first reported about the new buggy from Helion, the Criterion, Right Here. Now Helion has released a video showing just how fast the Criterion is. Using a radar gun and some old fashioned street running, the video shows the top speeds of the Criterion compared to several of its competitors. The Criterion is shown topping out at 33 mph, pretty fast for a 7 cell brushed buggy. To get more information on the Criterion simply hit THIS LINK. To get even more Helion news check out THIS LINK right here on BigSquidRC.